Minimal impact to the environment..
To offer unique and high quality experiences. •	Safety Equipment in accordance with SOLAS (Safety Of Life At Sea). •	CE certified, European Union safety standard. •	Offshore category, built to perform optimal navigation under adverse sea conditions. •	Hull designed to open water, with sharp bow that allows safe and smooth navigation. •	Cushioned seating and back rest, to protect passenger;s back and neck. •	Dry storage for personal belongings. •	Solar pannels and extra batteries. •	Non toxic silicone hull cover, acting as eco friendly antifouling. 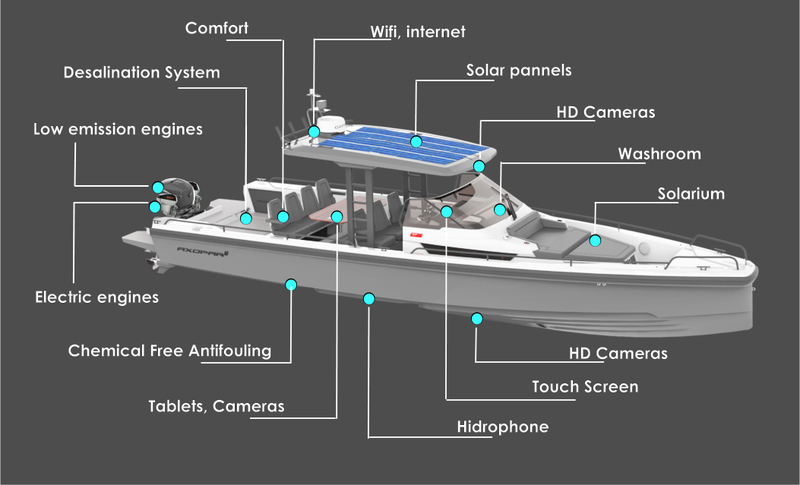 •	Integrated cameras in roof and hull. •	Professional cameras and long range lenses. •	Central touch screen and individual tablets. •	Real time video access.